1. 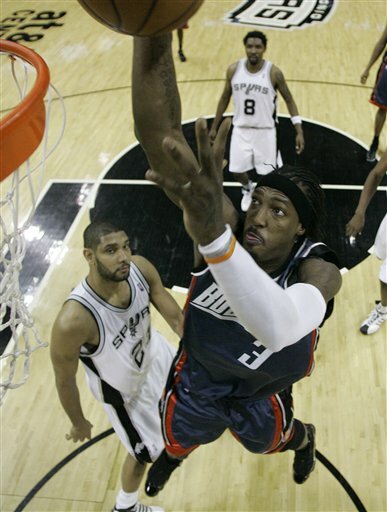 Disappointing loss Tuesday night, as the Bobcats drop one to the Spurs in San Antonio, 100-86. AP story here, box score here. The Bobcats six-game winning streak is over; overall record falls to 28-36. 2. Before I cover the game, have to comment on this great news from Bonnell. Essentially, the protection level on the draft pick that we have to send Denver from the Ajinca trade is better than anyone thought. Common knowledge previously had it that the pick was only “lottery protected” in 2009 (meaning that if we made the playoffs, we’d have to give up our pick). But per Rod Higgins, the pick is protected through #20 this year, meaning we’ll get to keep it even if we sneak into the playoffs. Now I’m not stupid. I know that we eventually have to give a pick back to Denver. And I know that guys drafted in the #12-16 range rarely pan out; and that this draft is particularly weak. But as handcuffed as we will be over the next couple of years to add talent to the roster (because of all the salary we are committed to), we need every opportunity we can get to add young, cheap talent. 3. Frankly, this was a pretty boring, grind-it-out game. Thankfully, it was close enough to stay intersting; much closer than the final score would indiate. In fact, the game was tied at 46 at the half, at 71 after the third quarter, and at 80 with under 9 minutes left. But the rest of the way the Spurs dominated, taking advantage of every mistake, crushing any hopes for a big win, and outscoring the Cats 20-6 for the final margin. The play-by-play of the fourth quarter is pretty depressing. Lots of “misses layup” and “bad pass” on the Bobcats side; compared to lots of “makes layup” and “makes 25 foot 3-point jumper” on the Spurs side. 4. What was going right during the first three quarters of the game? I noted several things. First, Manu Ginobili was in a suit behind the bench. That helped. Diop, who has shown a knack for containing Tim Duncan in the past, did that pretty well tonight and got extra minutes because of it. Radmanovic played very well early on, and was the leading scorer for the Cats at halftime (unfortunately, he wouldn’t score in the second half at all). And otherwise, the Bobcats continued to play well-rounded team basketball. 5. Roger Mason was pretty great for the Spurs tonight. Once again, the Spurs have shown that they are the masters of sticking to their system and finding diamonds in the rough who will fit in well with it. He went for a very efficient 21 points (8-16 FG, 5-8 3PT) and 5 assists in 36 minutes for a +16 +/-. Three of those three-pointers were from the crucial fourth quarter. 6. Not much stands out from the box score, other than the fact that we were outrebounded 42-32. The Cats were one Diaw point away from getting all five starters in double figures, though no one had more than 16 points. No double-doubles from anyone either. 8. The Cats don’t play again until Friday night when we host the Rockets at the Cable Box (7PM). Then they’ll have to hop a plane for a back-to-back the next night in Minnesota. Let’s get another streak started! well, at least we proved that we can win. but ill credit this loss to the sharp-shooting of SA. it was outrageously unfair how many buckets they were making. Sorry to "spam" your comments, I just didn't see a contact link. I'd like to get in touch with you about a blogging opportunity. Shoot me an email at derok82 at gmail.com.